They’re back – our Giant Swiss Pansy and Needham High School ornaments are back in stock. You can come in to purchase in our new Gift Shop, Tuesday thru Thursday, from 10am to 2pm. Or buy online anytime! Check out our new Gift Shop! Our new Gift Shop is open for business! 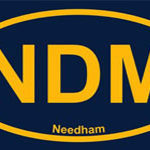 We have Needham gear – NDM Tshirts, sweatshirts, and hats – as well as a unique array of other Needham-themed gifts, including books, ornaments, and videos. And of course, there is always something “new” in the Heirloom Shoppe. Check us out – Tuesday – Thursday from 10:00 – 2:00, or online anytime! Good Books & Good Conversation! The Book Group meets on the last Tuesday of every month for discussion. The books can be non-fiction or fiction (as long as the history is good), and are chosen by the group. Check out our our current list and schedule, and join in! 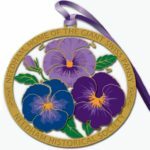 Give a Membership, or check out our selection of Books, Videos, Ornaments, and Cards. Or come to the History Center for treasures from our Heirloom Shop.